Fantastic shipping. Excellent ebayer. Highly recommended. bien de precio y calidad. estética perfecta. Calidad impresión aceptable. No ink but at this price still a very good buy. Delivered next day. As described and great value for money. Instruction booklets were hard to get but once worked out really easy to set up and great printer. It says print with wireless connection. Well mine is connected to my wireless and everything id ok even the photocopier is working but not the printer which I need most. Its sat on my desk for the past 3 weeks figuring out what to do next. I hope the cable which I have ordered saperately won't dissapoint me. Does everything it should and so cheap! Had to look up instructions online as the manual was a bit confusing but got it all set up quickly and easily. Print quality is good but not amazing, however you get what you pay for. All in all a really good bargain! I wanted a printer that I could use from my iPhone & iPad and it does just that. Took 15 minutes to set up & the print is a good quality. 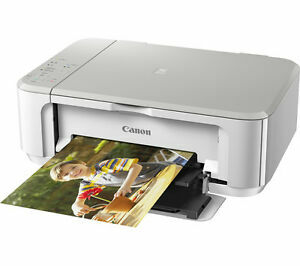 This is a good looking neat sized printer with excellent quality print out. Only downside is the combined colour cartridge - it would be more economic to have separate cartridges.